Nutrition experts say the best diets include 5 to 13 servings of vegetables every day. But how do you get that message across to kids and other family members, who might not agree? Well, you can sneak veggies into food. But there are ways to inspire kids, and adults, to eat them on their own. Experimental psychologists at Stanford University found that when preschool children read storybooks that include information about the importance of eating a varied diet—and how their bodies digest food and use nutrients—they not only grasp the concepts but are more likely to voluntarily eat more vegetables. Another good way to encourage healthy eating habits is by example, so be sure you're eating plenty of veggies yourself. Try the same vegetable in different forms. For instance, family members who don't like vegetables cooked may prefer to eat them raw or just lightly steamed. Jazz up vegetables with "finishing flavors," such as lemon juice, garlic heated in olive oil, chopped toasted almonds or walnuts, or Parmesan cheese. Stir a little drained, grated zucchini into pancake, waffle, muffin, biscuit, or quick-bread batter. Add finely shredded carrots to tomato sauce, ground turkey meat for burgers, and rice side dishes. Be careful not to overcook vegetables like broccoli, cauliflower, green beans, spinach, cabbage and others that can easily become mushy or discolored and generally unappetizing. Serve more Asian-inspired dishes--they tend to include more vegetables than American-style meals. Add chopped fresh tomatoes and cooked vegetables, such as green beans and broccoli, to classics such as lasagna, stuffed shells, or baked ziti. Stuff a baked potato with finely chopped cooked broccoli, onions, sweet peppers or other vegetables, and a sprinkling of Parmesan cheese. Drizzle with olive oil or yogurt. Add grated carrots, broccoli stems, or Brussels sprouts to coleslaw mixtures. Add roasted peppers, tomatoes, or asparagus to potato salad. Make potato salad with a half-and-half mixture of white or gold potatoes and sweet potatoes. Initiate "Meatless Mondays" and try a new vegetarian entree for dinner each week. Blend low-fat yogurt and garlic-seasoned, cooked spinach until smooth to make a dip. Serve with raw veggies such as snow peas, carrot sticks, and pepper strips. Use vegetables as condiments: make your own pickles, relishes, and chutneys to serve with poultry, seafood, meat, and other veggies. Add cooked or leftover vegetables such as spinach, kale, onions, peppers, or mushrooms to omelets and scrambled egg mixtures. Increase the ratio of vegetables to meat in soups, stews, and savory pies. Create a quick, cream-of-any-vegetable soup by pureeing cooked leftover vegetables—broccoli, cauliflower, spinach, mushrooms, peeled asparagus, carrots, or winter squash—and stirring them into seasoned broth. (Optional: add sliced green onion and garlic.) Heat up, then stir in a little milk or top with a dollop of plain yogurt just before serving. Turn side-dish salads into main courses by increasing the amount (and variety) of veggies and adding a small amount of protein such hard-cooked egg, cubes of tofu, or leftover cooked poultry or seafood. Tuck thin slices of cucumber or avocado into sandwiches. Make your own salsa with a base of finely chopped fresh tomato, pepper, sweet onion, and cilantro. Stir in corn kernels for sweetness and season to taste with hot sauce or chili powder. Add cooked broccoli or cauliflower florets to macaroni and cheese or tortellini served with cheese sauce. Try a savory smoothie made with fresh ripe tomatoes, low-fat yogurt and a pinch each of dried basil or oregano and salt. Grill, broil, or roast cut-up vegetables tossed in olive oil and lemon juice or vinegar. These cooking methods intensify flavor and add sweetness. Bake a carrot cake for your next family celebration. Susan McQuillan reviewed this article. Harvard School of Public Health: Vegetables and Fruits: Get Plenty Every Day. 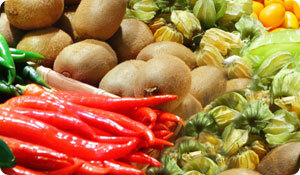 Web accessed 8 Oct 2013 http://www.hsph.harvard.edu/nutritionsource/vegetables-full-story/. Stanford University News: Kids eat more vegetables after nutrition lessons, Stanford study finds. 3 July 2013 Web accessed 8 Oct 2013 http://news.stanford.edu/news/2013/july/kids-healthy-eating-070313.html.